Human relationships can be intriguing, heartbreaking, funny, frustrating, and soulful (among other things). Sometimes all at the same time. 20 Short Ones takes you from Northern Ireland to New York and places in-between. Each story offers a snapshot experience and an opportunity to emotionally relate to the age-old mystery of how friendships (romantic or otherwise) happen. Dan Salerno has traveled to Northern Ireland five times and to Japan (once) on mission trips. This was before he lived in New York City for eight years, earning a masters degree in social research while working for the National Coalition for the Homeless. After that he worked and lived at the Catholic Workers Joseph House near the Bowery, before moving back to the Midwest. He eventually returned to New York and worked for a childrens ministry in Brooklyn, NY for 16 months soon after 9/11. Dan has written for a variety of publications, having over 100 articles published. He has taught English Composition and has been a kids church teacher for over 25 years. 20 Short Ones, published by WestBow Press (a division of Thomas Nelson Publishing) is his first book. Its an engaging, hope-filled collection of short stories each focusing on how relationships (romantic and otherwise) begin, told from a faith-filled (Judeo-Christian) perspective. Tell us a little about yourself. I'm from the Midwest, but lived in New York City for eight years. While there I was part of the staff and lived at the headquarters of the Catholic Worker movement (Joseph House on the Lower East Side). I also was Chief Researcher for the National Coalition for the Homeless. After 9/11 I came back to New York and was part of Metro Ministries based in Brooklyn for 16 months. Metro sends out teams to conduct sidewalk Sunday School in four of the five boroughs of the city, engaging kids in their own neighborhoods with the message of hope we have in God. In-between these events I went on five trips to Northern Ireland volunteering with a reconciliation ministry there and went on one trip to Japan with members of my home church, supporting a sister-congregation we have there. What was your motivation behind this project? I read through the Bible (cover to cover) four times in 2013 which was the kick-start for thinking about relationships, in general. Then, I began looking back on my life and saw it as a series of stories, each one with a lesson. 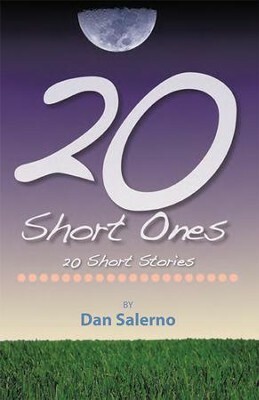 Many of the short stories in 20 Short Ones are a blend of things that actually happened, with the spice of fiction added. So I guess you could say my overall motivation was looking at relationships from a faith-filled perspective. What do you hope folks will gain from this project? Hope! There is always hope in God! How were you personally impacted by working on this project? Believe it or not, I actually got a whole lot closer to God through writing this book; seeing God at work in the creative process, seeing God as fun and spontaneous as well as holy. Who are your influences, sources of inspiration or favorite authors / artists? There are so many gifted, wonderful authors and artists! Among them: Ann Voskamp, Donald Miller, Bob Goff, Brandon Manning, Rich Mullins, Rick Warren, Simone Weil (more a philosopher who wrote Waiting for God), Thomas Merton, Bill Johnson (who like Rick Warren is a pastor), Dorothy Day (who with Peter Maurin started the Catholic Worker movement but was a brilliant writer) and Heidi Baker (who is primarily a pastor with her husband Rolland in Mozambique). Anything else you'd like readers / listeners to know: I say a few things about organized forms of religion in 20 Short Ones. They are not meant as theological talking points, just personal observations. I love my home church! I've been attending it for almost three decades. It's important to go through life accountable to friends who are wiser and more seasoned. It helps us grow!